Alhamdulillah, I managed to conduct another Science Playdate despite the strong Braxton Hicks that begun since third trimester kicks in. I know my dear husband would prefer me to rest since I was in the 37th week of my pregnancy. 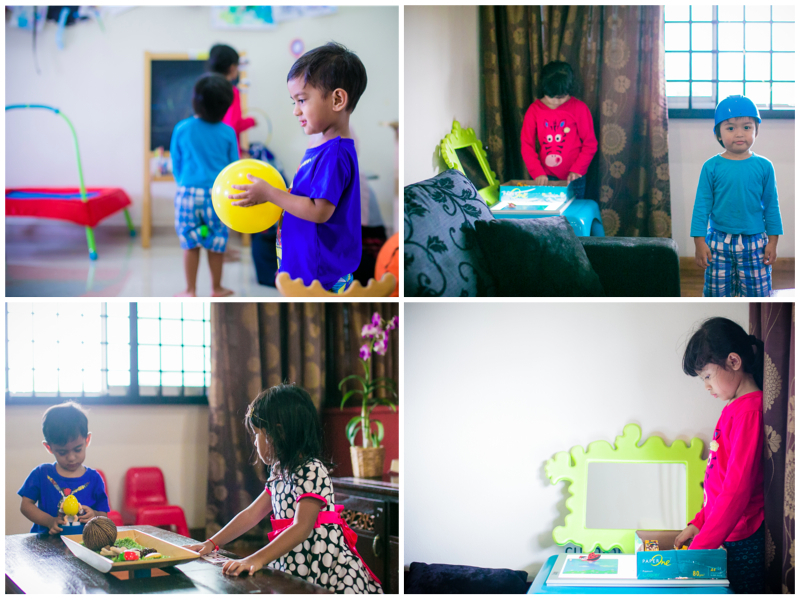 This time, I had a very cozy session with five adorable participants. The theme of the Science Playdate was “Energize UP”. We explored selected type of forces and energy – electrical energy, static electricity, magnetic force and lastly kinetic energy. It is called Be Amazing Toys Energy Stick. Ammar and Sofie had fun with the Energy Stick during snack time. Next, the participants were introduced to static electricity. It worked fine the day before when it was hot and there was not much wind. However, it just stopped raining before our playdate and I suppose it was too humid that the experiment did not really work. For this experiment, the participants were to inflate the balloon and rub it against their hair. Then, there were given bits of tissue paper for them to try to pick up with the balloon. When you rub a balloon against your hair, the balloon gain electrons causing it to be negatively charged. It is able to pick the tissue as it is attracted to the positive charged particles of the tissue paper. Next, they were introduced to magnetic force. I had requested the kind mommies to bring ten metallic items – the NEW Singapore coins (apparently, the older coins are not magnetic), paper clips, safety pins etc. With a ziploc bag, we made our own magnetic bag. We added some water and oil with a coloring of their choice. Then they decorated their bags with poms poms, cut out pieces of foam paper, ribbons and, of course, the metallic items that their mommies had brought from home. The kids had the most amazing time crawling under the trampoline, even when one of the others attempted to jump on the trampoline. They ran around, played with the balls and tried out the energy stick. I wanted to proceed to the next activity but the kids were having so much fun I decided to let it stretch a little longer. For the next activity, we touched on kinetic energy. 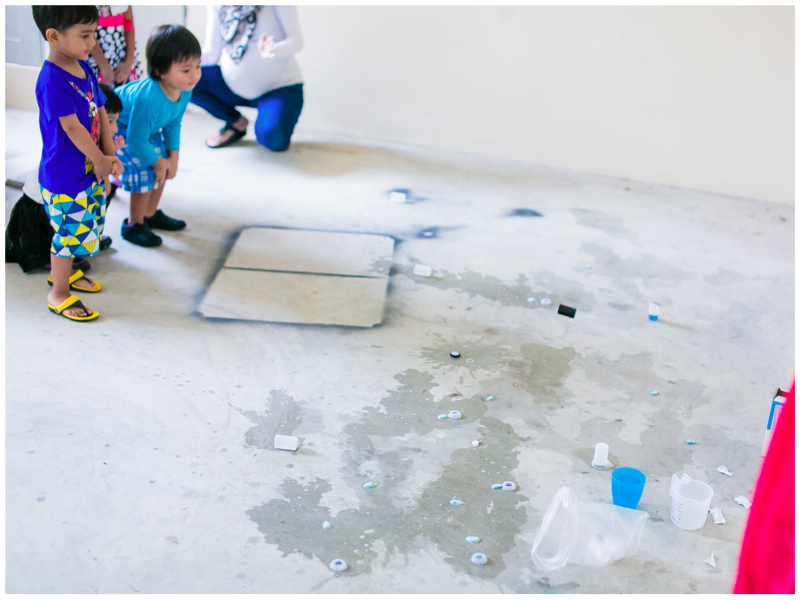 The fun and excitement was too great for the kids to just do the experiment once. Thanks to one of my friend who kindly donated his film canisters, we made rockets with water and denture cleaning tablets. They did a total of 5 rounds of these. The kids expressions and anticipation were priceless. In the presence of water, both the acid and sodium carbonate in the denture cleaning tablets were able to react and form carbon dioxide gas. Since all matters occupy space, the build up of the formation of carbon dioxide gas pushes the lid of the canister as gas particles are far apart in random arrangement. In addition, gas particles moves at high speed and randomly. This cause the lid of the canister to fly up like a rocket. 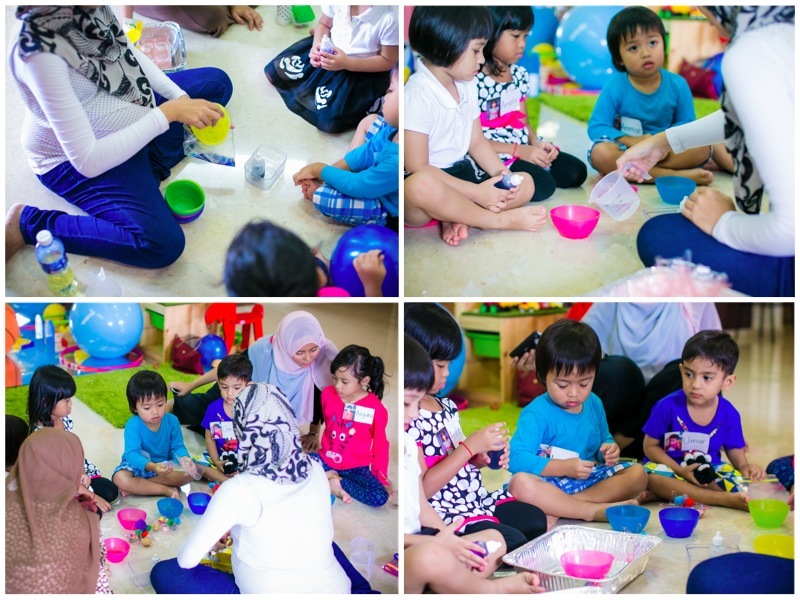 After the last activity, the kids played with each other while the mommies shared their experience on different areas. I definitely had a great afternoon because I’ve learned quite a bit from the mommies at the same time. Science Playdate #4 next pretty soon? 😛 Well, I have promised my hubby to take a well rested break. 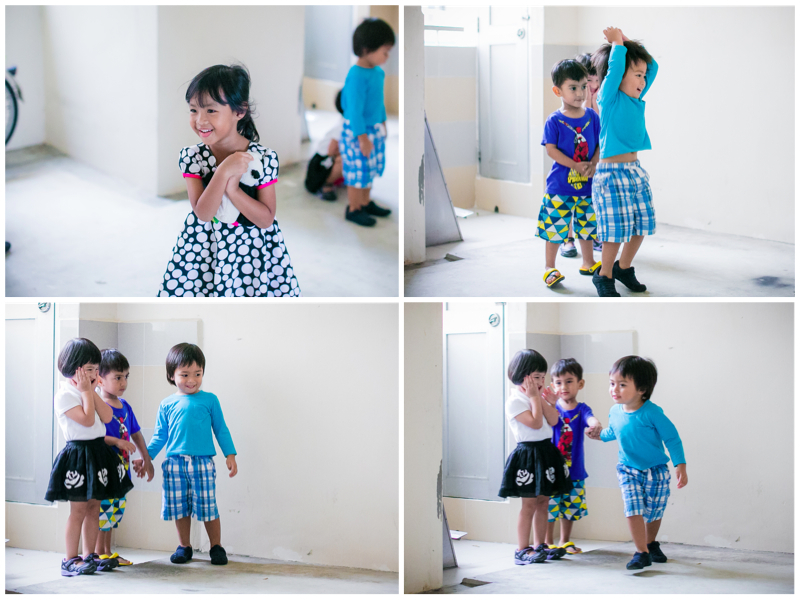 InsyaAllah, once I am able to handle two kids effortlessly, I might be back. I need all the prayers from you.